WordPress is an undisputed leader when it comes to choosing a content management system for the web publishers. 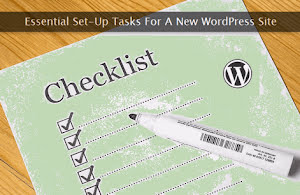 Generally, it takes less than five minutes to install a new WordPress blog on almost any web server. But, the basic installation alone doesn't complete the essential blog setup necessary for running a secure and user-friendly website. Fortunately, configuring these basic yet extremely essential options is not that hard provided you know what to configure and how to configure. This comprehensive tutorial will give you a step-by-step walkthrough to apply all the critical and important settings after completing the initial installation process. If you're technically challenged, do not try to configure these settings on your own. Instead, hire an expert to do the same for you. Some of the generic configuration settings mentioned below can be applied to static HTML sites as well. So, let's get started and learn to configure a basic WordPress installation with all the essential settings to give the best experience to the visitors. Note: The order of these settings does not govern their priority. You can configure these settings in any order. Two important files that must be secured from intruders are .htaccess and wp-config.php which are generally present in the root directory of your blog. Both of them contain important data and directives to keep your blog working in good condition. If an intruder is able to penetrate into one of these files, he can bring down your blog in no time. Check for correct file permissions for these files and include the following directives in your .htaccess file to prevent any kind of unauthorized access to these files. The directives given above harden the security of these two files and keep your blog's sensitive information, impenetrable. Because this configuration is related to security, you must complete these settings as soon as possible once your blog is up and running. You can also check out these important .htaccess directives vital for a new WordPress installation. The blog's title and its description (tagline) are of utmost importance both for its identity and for basic on-page search engine optimization. The title is more or less like a brand name for your blog and the description tells what the blog is all about. Both of these are absolutely essential settings one must complete after the blog installation. To provide the blog's title and tagline, go to Settings → General option. Here, use the Site Title and Tagline input fields to supply the blog's name and description. Make sure you keep both the fields short, unambiguous, and catchy. Do not stuff lots of keywords in the tagline as it may backfire instead of doing some good. Another extremely important setting that needs to be configured is the time zone and the associated date format. To complete this step, once again go to Settings → General option and modify the Timezone and Date Format fields. Accurate time zone is also necessary for the correct functioning of scheduled posts and for scheduled blog backups. If you struggle to find your time zone, use this handy tool. For a better presence on search engines, one of the important settings is a custom and better permalink structure. This ensures that the resulting post and page URLs are SEO-friendly. A better permalink structure may include category name followed by the post slug. Another good example is the date of the post followed by the post slug. It's up to you which one you choose for the blog. To configure the permalink structure, open your blog's dashboard and go to Settings → Permalinks → Permalink Settings → Common Settings → Custom Structure option. Here you can use the placeholder (example shown above) tags to customize the permalink structure. All the available tags are listed right below the text input field to help you configure the same, with ease. It's a form of canonicalization that must be configured properly to avoid the loss of traffic as well as for implementing better site-wide SEO. Every blogger has its own preference when it comes to prefixing www in front of posts' permalinks. Some of us like to prefix it, while others simply avoid it. Whatever is your preference, you must configure your preference so that all the traffic is permanently redirected towards your preferred URL structure. To ensure that WordPress automatically handles this preferred domain redirection, automatically, go to Settings → General → General Settings option. Here, you can set your preferred domain through WordPress Address (URL) and Site Address (URL) options as shown in the image below. In case, your preferred domain choice is not getting redirected correctly, you may use the following .htaccess directive to redirect the blog's URLs, correctly. Use one of the directives given above that goes with your preference. Do not paste both the directives as it may create an infinite redirection loop making your blog, inaccessible. This setting is also considered as one of the most important configurations that must be completed for better SEO and for seamless browsing experience for the visitors. A newbie blogger is not aware of the fact that every time you update your existing blog post, a new post copy is made in your WordPress database. This creates a large number of unused copies that not only makes your database heavy but also consumes extra storage space. If you're publishing several posts every day, the volume of post revisions can swell exponentially. To address this issue, you can either limit the number of revision copies for every post or you can completely disable the revision feature. In both the cases, you must also configure short time duration for automatic saving of the blog posts. The ideal time duration is anywhere between 3 to 5 minutes. Add the following directive to the wp-config.php file to configure the auto-save interval for the posts. The number 180 is the number of seconds (3 minutes) for the auto-saving interval. You can adjust this time duration as per your preferences. To permanently disable the post revision feature, use the following directive. To limit the number of revision copies instead of disabling it completely, use the following directive. The directive shown above limits the revision copies to 3 for all the blog posts. Once again, it's up to you how many revisions copies you need for a post. Adjust the number accordingly. In future, if you want to re-enable the post revision feature, replace false with true within the respective directive. Link notifications from other blogs can be a headache at times. This problem becomes graver when trolls and spammers target your blog and send bogus trackback notifications. If you're feeling that these notifications are introducing unpleasant conditions for you, you may consider turning them off completely. To do so, go to Settings → Discussion → Default article settings option. Thereafter, deselect the first two options as shown in the image below. If you've already imported your posts from an external blog, the settings done above will have no effect on these older posts. This setting only affects the new posts created by you. You must use the following SQL commands to disable these notifications for all the published posts. Seasoned and technically sound bloggers can use SSH to fire these commands from the shell prompt. Others can use phpMyAdmin console to run these queries. Make sure you've selected the right database before you run these commands. You must replace 'wp' with the actual database prefix you're using for your tables. Once these annoying notifications are turned-off, use simple Google Alerts to get notifications about new inbound links pointing to your blog. This is yet another important configuration which is often delayed or ignored after installing a new WordPress blog. You must fill in your author profile details as soon as possible as it is associated with two very important aspects. Firstly, it correctly displays your details (avatar, full name, description) if you've inserted an author box that pulls information from your profile. And secondly, if you're making a custom author page, this prefilled author information can ease the entire process. You must fill out the first name, last name, URL, display name, email, website and biographical info. Pro Tip: Do not use administrator's account for content publishing. Create separate editor and author accounts for writing blog posts. If you're running a multi-author blog, filling profile details is the very first important step while adding a new contributor to the site. This step is most necessary for niche, business, and professional blogs who not only offer different types of services on their blogs but also monetize them with third-party ad networks. Following are some of the important pages one must create after installing a new blog. Copyright Policy Page - Although, every single piece of content is automatically copyrighted the moment it is published on the website, still it's a good idea to declare a copyright policy if you allow some form of content consumption by the external websites. This policy page explicitly declares your content ownership for all the posts published on the blog. You can use a copyright policy template to create a modified version that fits your needs. Comments Policy Page - If you're receiving a decent volume of comments on a consistent basis, do make a comment policy to ensure visitors know their rights and restrictions while participating in discussions. Contact Page - A contact page is easy-to-make and generally contains a simple web form enabling the visitors to make a direct contact with you. Make absolutely sure that the contact form has an anti-spam solution to avoid junk submissions by the bots. About Page - Do you know that your blog's About page is among the most-visited static pages at any given time? Yet, we do not pay much attention to it and simply complete it with a small introductory paragraph supplemented with an optional photograph. About page is an excellent place to convert your traffic and therefore we must come out with a plan to make most out of the traffic landing on it. Here's an excellent guide to creating a custom About page. After completing the new blog's setup, you must add a sitemap of the same to the Google Search Console. This ensures that your blog is quickly and correctly indexed by the Google search engine. It also enables you to keep an eye on the search performance metrics including the SEO issues, if any. Here's how to submit a sitemap. If you're using the new Google Search Console interface, use the Add property option to submit and verify your blog for indexing. If you're using the old webmaster tools interface, use the ADD A PROPERTY option for the same. In both the cases, you have to provide the blog's address in the text field as shown in an example above. Next, you have to verify the ownership of your blog through one of the available methods. The easiest way to complete the verification process is to download the HTML file provided by the search console and then upload (via FTP) it to the root directory of your blog. If you prefer an alternate way, you can go ahead with that too. And, the last and the most important step is to submit the blog's sitemap. To get started, press the ADD/TEST SITEMAP button and enter feed/ in the text box. Press the Submit button to complete the process. I'll strongly recommend completing this process so that your blog has a healthy search engine presence, right from day one. Tracking your blog's traffic is of prime importance to optimize and improve the overall visitors' experience as well as to find out the problems with your content. The best place to insert the analytics tracking code is right before the </head> tag. In our example, we'll use Google Analytics which is the de-facto web analytics system for the websites. There are two different ways through which you can integrate a web analytics script with your self-hosted WordPress blog. The first one is the manual approach and the second one is the plugin-assisted integration. To do it manually, first, create a child theme to prevent overwriting of code on subsequent theme updates. Thereafter, you can add the following code to the functions.php file. One must replace both the instances of GA_TRACKING_ID with the Google Analytics property ID associated with your blog. The property ID has the following UA-1234567-12 format. Note: This is just an example (UA-1234567-12) of the property ID. Do not use it for your blog. In case, you do not like to mess with code, use a plugin for web analytics to ease the integration process. We're living in an era, where social media platforms are of prime importance no matter the kind of online presence you have. Their value becomes more important if you're publishing content for the masses. Social media helps in content syndication and for gaining new subscribers and followers. Integrating social sharing options on your WordPress blog helps in disseminating your content on various popular social media networks to get more eyeballs for the published posts. Use one or more social plugins given in the list mentioned above to quickly and easily integrate social sharing buttons on single post pages. Integrating the same on static pages is not needed. But, for highly customized squeeze or archive pages, social sharing features can be integrated. Do make sure that your social sharing features work correctly in the responsive mode too on smaller devices. Generally, if a visitor lands on your blog through a broken link (nonexistent page), he is shown a crude error page. This is a very annoying experience for the visitor which can be easily avoided through an easy setup from your end. You must create custom error landing pages for such conditions and should configure redirection to these pages whenever a visitor is faced with one of the errors conditions. Following are the .htaccess directives which can be used for this kind of redirection. If you're using a highly popular premium theme, chances are you never need to go through a cumbersome process of configuring custom 404 pages for your blog. Such themes enable you to easily configure this process in a few simple steps. Remember, creating a custom error page is just half the work. You must populate it with relevant content so that visitors' can be redirected towards your main content on the blog. This is done easily by highlighting the best content on these pages along with a search box so that visitors can look for the information they need. No blog setup is complete without providing handy options for subscribing to the post updates via email. There are several good email subscription services like Aweber and MailChimp you can integrate with your blog, quite easily. Both the services mentioned above are premium. If you do not want to spend money on this feature, use a popular and free solution like Feedburner. While configuring the email subscription service, I'll strongly recommend configuring a custom domain email setup too to be used for blog related communications. Feel free to integrate the email subscription web forms at the key locations within your blog's layout. Right from the beginning, configure a caching system on your blog to give a blazing fast browsing experience to the visitors. A caching system creates a static HTML copy of all the most popular pages on your blog. These static pages are instantly served to the visitors thus speeding up the page opening time by many folds. There are two different ways to set up a caching system on a WordPress blog. The first method uses the native caching system of WordPress and is a bit technical and cumbersome process. Here's a complete guide for the same. The second method is comparatively easy and involves the use of plugins. You can grab one of the powerful caching plugins to complete the entire setup in a much simpler way. After caching configuration, do make thorough tests for performance gains to ensure that the setup is indeed working correctly. Another important new blog setup feature is the configuration of a content delivery network (CDN) which assists in further speeding up the page load times. A CDN is a group of geographically distributed servers which store the static assets of the blog. The visitor nearest to the CDN server is given the static data instantly instead of fetching it from the blog's web server. Following is a good CDN setup guide. If you're hosting audio or video content on your blog, the use of content management system becomes more necessary. In such a scenario, failing to setup a CDN can gobble up your web server's bandwidth in no time. A secure WordPress blog with https in its URLs is appreciated by both search engines and web browsers. It becomes more necessary if you're doing eCommerce transactions on the blog. If you do not have enough budget for an SSL certificate, I'll recommend Let's Encrypt to get one for free. If your blog already has some posts, make sure you've updated the internal links with their https equivalents after configuring the SSL certificate. Having an SSL setup is good from an SEO perspective too because Google and other popular search engines consider it as one of the ranking factors. One of the most annoying and grave problems new bloggers have to deal with is the flood of spam comments on the published posts. The best way to deal with this issue is to preemptively block and slay all the spamming attempts. To do so, all you need is an effective anti-spam solution. Some good ones are listed below. While selecting an anti-spam solution for your blog, make sure it protects both comment web forms as well as custom contact forms. One can also combine a CAPTCHA plugin with an anti-spam solution for added deterrence. A blog setup is incomplete unless you've configured a reliable backup system. Whether you want to transfer to a different web host or want to reinstate a hacked blog to its last stable state, these backups are absolutely necessary to avoid loss of time and money. Once again, I'll propose two different methods to configure this essential setting. Experts can go ahead with the manual approach especially if they're using a VPS server. Use the expert way (mentioned above) for blog backups only when you're comfortable with the command line environment. Try these methods on a demo blog before applying them to the live blog. General users can pick one of the blog backup plugins to keep copies of their blog as a whole at a secure location. Do not hesitate in buying a premium backup solution to ensure you can recover your blog without any issues, whenever required.